I was having dinner with my friend, Patrice, and she described her best travelling moment as sitting on the lawn of a resort in Papua New Guinea, and eating coconuts. It was her first time on grass in three years, because she had lived in a concrete jungle, and the resort lawn overlooked the ocean. The coconuts were fresh from the palm tree, and were sticky and delicious. There she sat, eating and slurping away as she gazed out at a spectacular view and scrunched her toes into the grass. It was pure glee. Glee is not only a great word (try saying it out loud – you’re smiling now, aren’t you? ), it is a wonderful state of being. Glee only comes when you are right in that moment. When you’re in the thick of glee, there is no thinking and there is no worrying; there is only divine joy. There is no real formula for glee either. It is hard to seek out, because it just happens, and before we know it, we are basking in it. For traveller’s, these are moments that we remember with clarity, the emotional snapshots we file away in our memories to revisit when we need them most. Since that dinner, Patrice’s story has inspired me to write of my own moments of emotional alchemy, when I have experienced glee while on my travels. I thought I’d start with my encounters with creatures. 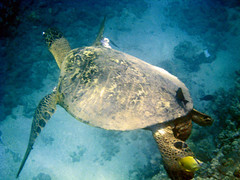 Snorkeling off the coast off Maui with green sea turtles was what started my love affair with these serene beauties. They move so slowly and gracefully, as though there is all the time in the world. All fears I had about being in the ocean vanished as I dreamily paddled above them, and I was delighted when a grand old soul popped his head up above the surface about two meters from me. I am sure he gave me a wink. Up the New South Wales coast, at Copacabana, my friend Paulie has a beach house (It is his home and it is stunning, and I am jealous, but this isn’t the time or the place). 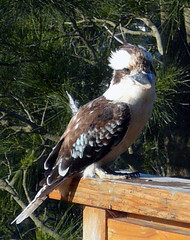 The kookaburras love to come and visit Paulie’s beach house, because they know they will get a feed. This fellow hung around for about 20 minutes and ate raw meat from my hand, which intrigued a fellow party-goer aged two. For some reason, dogs love me. This has taken some getting used to. I have a long-held fear of big dogs since I survived a childhood attack by a German Shepherd. Regardless, dogs do not know this, and in my travels I often make as many canine friends as human ones. 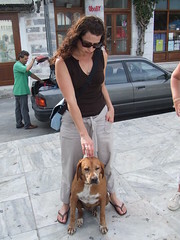 On Siros, in the Cyclades Islands of Greece, this dog met me and Ben in the main square, then took us on a tour of the town. She was such a lovely spirited dog, and a little naughty too (she chased and cornered a cat, and wouldn’t come until we threatened to leave without her). After a couple of hours, she led us back to the square and we thanked her for the tour with a bag of chips. Many of the dogs in Greece are homeless, but this one had a collar so she belonged to someone. For those two hours, however, she belonged to us. 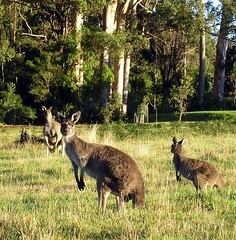 I love kangaroos. 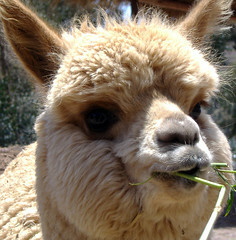 They are almost as cute and cool as llamas. My dad (Ray) and step mum (Gail) live on the south coast of Western Australia in the tiny hamlet of Denmark (yes, that was intentional). 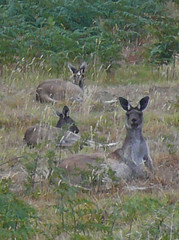 Their home is in a semi rural area, where the roads and gardens are shared with the native kangas. When I wake, and before I drink my freshly squeezed orange juice, I go and say good morning to the mob. They look up from their eating, perfectly still, except for their mouths that continue to masticate. After a few moments, they decide that I am not as interesting as I obviously find them, and they go back to their breakfasts. In the afternoon, they lounge, or fight if they are boys and are bored, and eat some more. Dad tells the story of a joey, fresh from the pouch, attempting to hop across the road. He was hopping with all his might, while his mother waited for him on the other side, but for all his efforts, he was only hopping on the spot. Yes, kangaroos are funny creatures. Lambs like to frolic and there are few things more adorable than a frolicking lamb. I saw hundreds of the things all over New Zealand as we drove the winding roads. Leaping, jumping, running, frolicking. I would laugh aloud, as they are even clumsier than me. On our quad bike tour I got to pet a lamb, which was probably not as much fun for the lamb as it was for me. He, she, it was bleating like I was choosing it for its shanks, but I just pet its curly little head instead. Some days later, Ben and I were driving to Christchurch, and found ourselves being unseasonably snowed upon. We stopped at a tiny town – one church, and one abandoned shack – and took in the silence that comes as snow falls in the middle of nowhere. Well, almost silence. I could hear bleating. 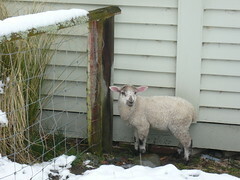 I went off around the back of the church, and there hiding in the woodpile was this little lamb. He came to me like a dog would, and stayed close by my side. 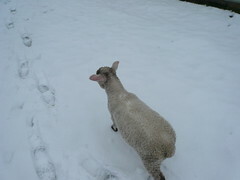 The poor little mite had wandered too far from mum, and like in a lost kid in the supermarket, was scared. I pointed it in the right direction, and it ran off to reunite with mum (who seemed indifferent to her terrified child). I had lamb shanks for dinner that night. Yes, true! I am not Dr Doolittle, but I do talk to animals. It is a reflex response now. I can’t help it. My voice travels up a few notches, and before I know it, I am having a one-sided conversation with one of mother nature’s creatures. I remember once in a hotel in New Zealand I asked Ben a question. He didn’t answer even though he must have heard me, so I asked again. “Are you talking to me?” he replied. I looked around the room, empty of people except the two of us. “Um, yes.” He smiled at me, “I thought there must have been a bird outside and you were talking to it.” How could I argue with that? I guess I talk to them, because I am in a moment that I don’t get to have everyday. These animals intrigue and engage me, and before I know it, I am not worrying or thinking about anything else. I just feel the glee. More later on gleeful moments in natural beauty, glee in response to human beauty, and glee from loving where I am, who I am with and what I am doing. 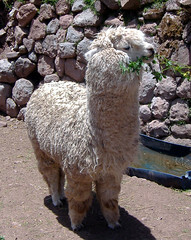 The Llama is hysterical, I can see why it’s your favourite! 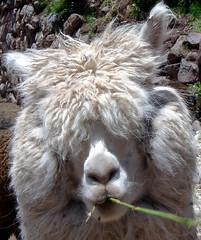 The llama, ahh, truly the funniest creatures…and medicine for any ill, even salmonella! You had me laughing out loud, as you know I do this too….and Mark also does it…I am turning him into a Barker…..